Content has become a pillar of B2B marketing. It can drive leads and enable buyers to self-educate along the path to purchase. In recent years, investment in content marketing has increased as more B2B leadership teams buy in to the programs. However, simply creating content and sharing it without a clear purpose isn’t enough for B2B brands to be successful. They must have a refined and documented strategy to stand out in a very crowded content landscape. 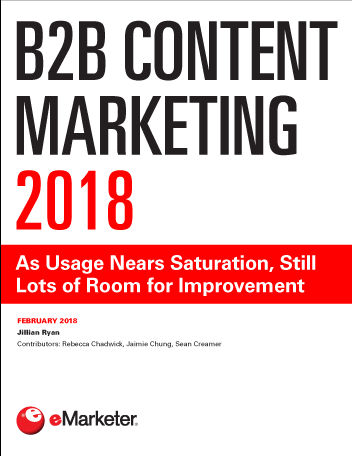 Creating quality content that is focused on the audience across all funnel stages is a major goal for B2Bs in 2018. A refined program should include strategic, efficient and innovative content created by a dedicated team. The most successful content should be integrated across all B2B marketing, advertising and sales initiatives. B2B marketers shouldn’t think of content as a separate entity to bring an audience to. Rather, it should be woven through all channels and used by all customer-facing teams, not just marketing. Measurement and attribution are still major challenges for B2Bs as they connect their content marketing programs to revenue. While some brands are building the technology needed to track buyers across content touchpoints, those that don’t will not be able to prove return on investment (ROI). "eMarketer estimates that 87.0% of US B2B companies will use digital content marketing this year."